Terri, to me it looks way overexposed, but I guess it's intentional, and I like it this way too.. I always shoot between f/13 & f/16 on a Sunny-snowy day.. Thanks John...it was actually completely overcast and snowing. I have some that have the correct exposure...but, I really liked this much better. It was more interesting. This is very good Terri, the exposure has given it a lovely high key look. Great minds think a like! I actually was thinking about cropping it that way. The original has more on the left too...I'll go back and recrop. Thanks! I actually like where the tree is, it's not the center but it is also not to far off the center. 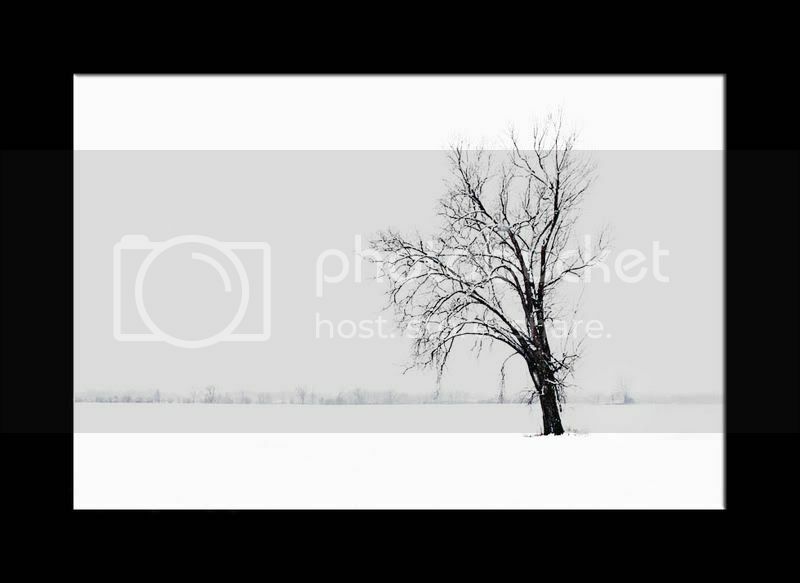 One suggestion, clone out the grass up front so it's all snow and give the viewer on the tree to see. Wonderful shot. So does this fit the "simplicity" challenge? Now that is STUNNING Terri. It fits the theme as far as I am concerned, if you don't win with this pic then there is no justice in the world. It has my Vote even though I am not on there anymore. Thank you Sharon...I'm a little gun shy after all the drama with the "curves" challenge. I just put it up. Finger's Crossed "X"
The person that beat me by one vote couldn't collect the prize (Lenbaby), since they hadn't been on the Zo long enough, not enough posts. So, they did a tie breaker with the three second place entries. And then I lost that by one vote. Shouchen actually sent me a PM saying that I should have won, since he felt my guitar was certainly the best up there. I personally think that I have rubbed a few people the wrong way over there...but, no more so that a lot of others. Oh well...do I sound a little bitter??? I really like the rework, very nice !! Thank you so much Stuart! I'm really pleased with it. I saw this yesterday and Liam didn't give me a chance to reply to the thread and make my comments but you certainly got all my suggestions through the rework it looks great. One of the things that was bothering me about the original was the grass peaking up in the foreground and the tree to far near the centre which you corrected very nicely. Last year I was reading an article on high key landscapes and simplity photography and I did some of these myself. It was fun to go back to some of my winter photos and rework those that were not quite the wow for me. We rarely get any snow here in my area so when it does I get out there right away. It only snowed once this winter and it was gone by the afternoon. I never even got a chance to get the critter bundled up before it was rain. Good Luck in the competition. PM me when it is voting time so I can pop over and vote. Terri, the rework is superb. 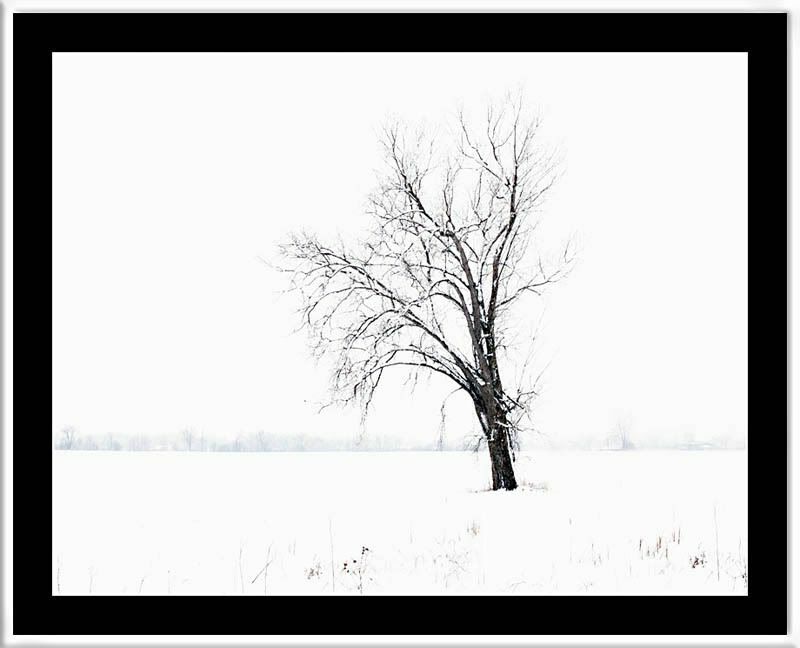 I love the white leading into the lone tree. Great job. A great shot now Terri, good luck in the comp. I think Terri's is better.